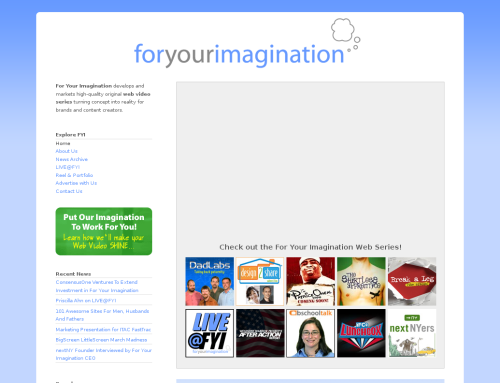 ForYourImagination is an firm that develops and markets online video programming. The company helps highly creative individuals develop video series that can be delivered over the internet. The concept behind this New York based start-up is one of the ways in which the web has disrupted traditional hold of media firms. Having reduced the entry barrier for creation of media online, there are a number of companies that are mushrooming on the power of delivering content for masses or the niche. Web video is growing online, but most of it still lacks the professional touch. In course of time companies like ForYourImagination will make these services available to creative individuals, which might eventually uplift the quality of video content that goes online. The way I see this proceeding forward is that either large scale media companies will buy into the online web video niche with key acquisitions or perhaps look to make such services available from scratch. One way or other the reduced barrier to media creation and distribution is going to bring forth several innovative business models.